Original 1955 US 20th century Fox photographic production still used to promote the romance, comedy film The Seven Year Itch. Directed by Billy Wilder and starring Marilyn Monroe, Tom Ewell, Evelyn Keyes. This piece is conservation framed and would be shipped by Federal Express. The size given is before framing. 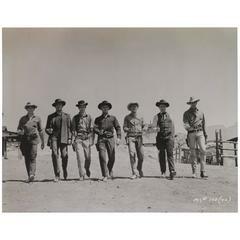 Original black and white photographic production still used to send out to the press to advertise The Magnificent Seven in 1960. Original US color production still used to send out to the press to advertise Taxi Driver in 1976. This is a great image of Robert De Niro in his taxi. Original black and white photographic production still from Audrey Hepburn, George Peppard's classic, 1961 romance. Baccarat chandelier poster black and white print, 2010 This photo is part of the advertising poster of Baccarat in Europe in the 2010s.